Pierwsza duża uroczystość rocznicowa połączona z nadaniem nagród Klubu— “Modjeska Prizes” (Nagrody im. Heleny Modrzejewskiej)—zaplanowana na 15 października, sprawiła nam trochę kłopotu organizacyjnego. Po raz drugi przyznaliśmy nagrody im. Modrzejewskiej za całokształt osiągnięć artystycznych wybitnym aktorom scen polskich. Najpierw okazało się, że nasza laureatka, utalentowana, słynna i bardzo zapracowana aktorka Teatru Starego im. Heleny Modrzejewskiej, ANNA DYMNA, w żaden sposób nie dojedzie do Los Angeles. Potem obiecana obecność MARIANA DZIĘDZIELA na ceremonii wręczenia nagród również nie doszła do skutku. Pan Marian musiał wracać do Polski na plan filmowy, więc odebrał swoją nagrodę podczas otwarcia Festiwalu Filmowego, 11. października, z rąk wiceprezesa, Krystyny Kuszty. Natomiast Anna Dymna poczekała na przyjazd Maji Trochimczyk do Polski i otrzymała swoją nagrodę w Krakowie, podczas konferencji o emigracji w Uniwersytecie Jagiellońskim (29. maja 2012 r.) w obecności międzynarodowego grona profesorskiego oraz przedstawicieli konsulatu amerykańskiego. Due to an unexpected change of plans of Marian Dziedziel who only attended the opening of the Polish Film Festival on October 11, he received his Modjeska Prize during the opening ceremonies and not at the Club's event. The award was presented by Vice President Krystyna Kuszta, accompanied by Andrew Z. Dowen, Board member. The program of our October 15 anniversary celebration focused on Polish Film Music and featured four guests: composers Bartek Gliniak and Pawel Mykietyn, and singers/actresses Marta Honzatko and Anna Kostrzewska "Anya" - who discussed film music and performed for us during the evening. The celebrations also included other awards for the Modjeska Club. He is an author of soundtracks to over 20 films, among others: “My Nikifor” directed by Krzysztof Krauze, “Palimpsest: A Hypnotic Mystery” directed by Konrad Niewolski , “The Sand is a predator” by Krystian Matysek, as well as “Joanna”, „Case Unknown” and „The Collector” by Feliks Falk. He is an author of the music to one of the most popular Polish TV series “For good and for bad” (“Na dobre i na zle”). The compositions of Bartek Gliniak have been performed at such festivals as: the International Festival of Contemporary Music “Warsaw Autumn”, Tage für Neue Musik in Zurich, Cracow Composers Festival, Synthèse Festival in Bourges, The International Rostrum of Composers (IRC), the 3rd International Contemporary Music Festival - Lviv (Ukraine). Since 1995 he has been cooperating with the Polish Radio Theatre and since 2006 he has been a member of European Film Academy (EFA). 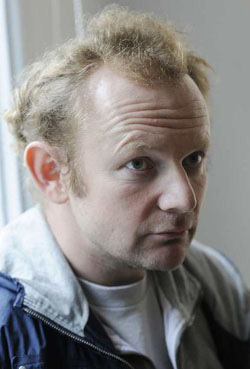 PAWEL MYKIETYN, born in 1971, is a Polish composer and clarinetist, who studied composition at Frederic Chopin Music Academy in Warsaw in the class of Włodzimierz Kotoński. He participated in workshops with Krzysztof Penderecki, Witold Lutosławski, Henryk Mikołaj Górecki, Michael Nyman, Magnus Lindberg, and Louis Andriessen. In 1993, Mykietyn debuted at the Warsaw Atumn Festival with La Strada. His composition „3 for 13” was awarded first place at the UNESCO International Composers Tribune in Paris. His works include: At Radek's (1993); Epiphora (1996), Piano Concerto (1997), Shakespeare's Sonnets (2000), the opera Ignorant i szaleniec / An Ignoramus and a Madman (2001) and the Second Symphony (2007). Epiphora received the first prize in the young composers' category at the UNESCO 4th International Rostrum of Electro-acoustic Music in Amsterdam, His successes continued, and in 2008 he was awarded Poland's top arts prize, the OPUS Award. Mykietyn plays the clarinet in the Nonstrom Ensemble, a quartet he founded which specializes in contemporary music. In 2000, he wrote music for his first feature, EGOISTS by Mariusz Trelinski. He was awarded Best Music Award at Gdynia Polish Film Festival for STRANGER, 33 SCENES FROM LIFE, TRICK and ESSENTIAL KILLING. He is the winner of the 2011 Hollywood Eagle Award for Best Film Music. MARTA HONZATKO is a Polish film and theater actress, a graduate of the Ludwik Solski State Higher School of Theater in Krakow (2006). Marta played the leading role in the major motion picture BLACK THURSDAY by Antoni Krauze, and was announced to be the Best Newcoming Actress in Poland for her part. She also has recently recorded her first CD and is the lead singer in the band "Honzatko Rozmontowana," with songs written by Michal Zablocki; lyrics and music by Al*eksander Brzezinski. She currently performs in the theater and you can see her on stage in the play "Casting", directed by Ewa Kornecka, premiering last August. She has also recently performed in a film titled HENIEK which was directed by Eliza Kowalewska and Grzegorz Madej. Marta is a dynamic and talented rising Polish actress and vocalist. ANNA KOSTRZEWSKA or ANYA is a graduate of the University of Warsaw, with a focus on Oriental Studies – African studies. A vocalist, songwriter and producer, Anna is the granddaughter of Herbert Karwacki, a talented Bydgoszcz Opera and Operetta soloist. She has been tutored for many years by the brilliant voice instructor, Ewa Kossak. She participated in many jazz workshops, including those with Lora Szafran, Grażyna Auguścik, Dave Stroud, Wandy Paar, Dean Kaelin, and Rocio Gutitard. In 2004 with Kamil Kucharczyk she co-founded the ensemble Carnival that performed in a number of Warsaw locations. In 2006 at the „Tokarnia” recording studio she recorded Bossa Nova and jazz standards, which were presented by Radio Jazz and PiN. In 2008-2009 she worked on her debut CD Anya, for which she wrote and performed the majority of texts/ She also produced the entire CD, premiered in May 2009.